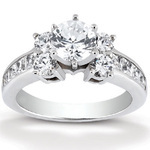 With our wide variety of diamond bridal rings, you can trust our specialists to help you find the best diamond ring your money can buy. 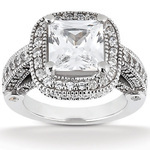 The Diamond Vault brings you a glittering array of style options, reflecting today’s hottest trends in bridal fashion rings, as well as the timeless traditions that connect past and present. Choose a band and setting that are comfortable for everyday wear and which will last for years to come. Then, play with different combinations of metals and gems to create a truly unique piece. Our bridal engagement rings come in white or yellow gold, with most styles also available in platinum—a perfect choice if you have metal allergies. Platinum is made without alloys and is considered hypo-allergenic. Browse our complete bridal fashion collection to find a beautiful diamond ring that is uniquely you, combining your preferred setting with your choice of diamond size and shape. 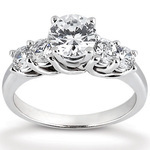 Settings are available in many trendy styles, from twisted bands with simple prongs to diamond-encrusted bands with round, oval, or square halos. 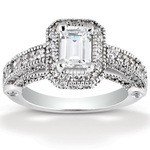 Use our easy selection process and find the perfect diamond cut for your setting, from traditional princess and round cuts to the up-and-coming Asscher and emerald cuts. Aggressive salespeople, a lack of knowledge, and limited choices can make buying a diamond ring difficult, stressful, and overwhelming. 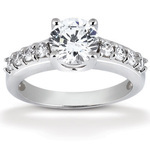 At The Diamond Vault, we aim to educate customers so they can more easily find meaningful diamonds and wholesale diamond engagement rings without the stress usually involved in making such an important decision. 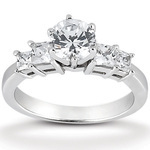 Our process is specifically designed to help customers who are unfamiliar with diamond jewelry. First, we aim to understand what you want and need, educating and guiding you toward an idea if you are uncertain during our first meeting. With your criteria, we provide a selection of products matching your requirements. We'll even give you a closer look using a 10X loupe, microscope, or magnifier projected onto a TV screen. Professional gemological instruments are then used to narrow down your selection. 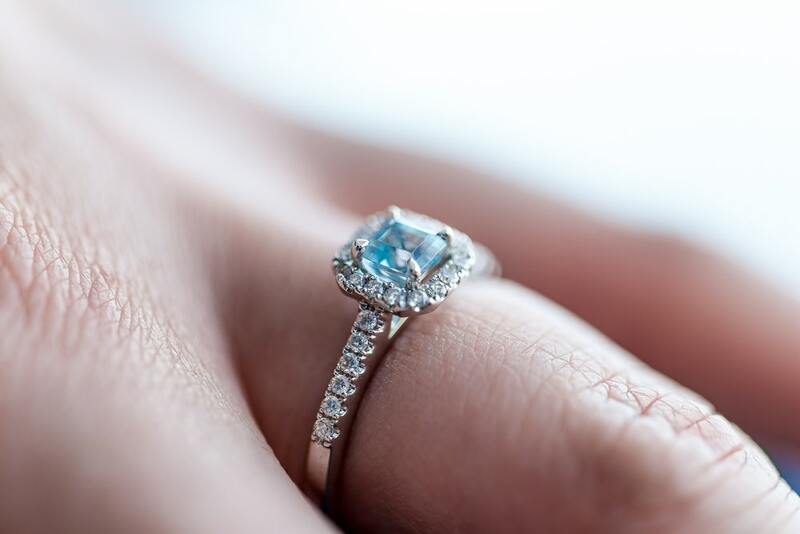 We'll show you how cut, quality, and diamond color affect a ring's look and price, and then help you find pieces that fit both your budget and your style preferences. 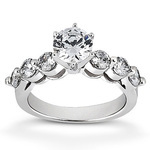 Once you've chosen a diamond, you can then select a mounting option from our wide selection of ring designs. 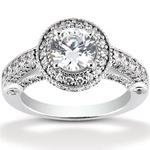 If you don't find what you want among our many stock styles, we can employ a custom design process that gives you full control and lets you build your own wedding ring. 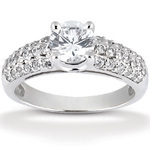 At The Diamond Vault, we make ring shopping simple. Whether you select a basic, classical, or intricate and modern style, we're there every step of the way. We also keep you included when creating custom design jewelry and won't finalize any designs until you approve of the wax mold. 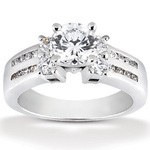 We also provide lifetime maintenance for rings and diamonds. 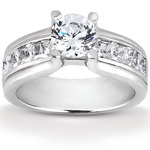 From cleaning jewelry and inspecting prongs to polishing nicks and scratches, our team is committed to ensuring you continue to enjoy your investment, and you (or your partner) are proud to wear it. 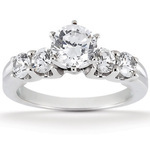 For the best prices in superior quality diamonds and rings, contact us or visit our store in Scottsdale, AZ in the greater Phoenix area.